Somehow, all is not lost inside the Notre Dame Cathedral. We are seeing the damage inside a day after an inferno tore down the Cathedral’s spire and burned through its vaulted ceiling. The actual structure of the building is still standing. And the two towers out front were saved. There are still some weak points of the building and officials say it will be a day or two before the ministry of culture can go in to recover large works of art, which are still inside. Some of the smaller, most treasured pieces were saved, including Christ’s crown of thorns and the 13th century tunic of French king Saint Louis. 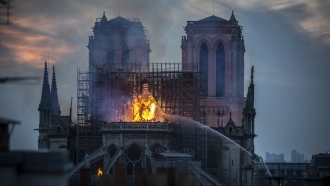 A French official says the rector of the cathedral, Monsignor Chauvet, personally directed firefighters to the most important items. The pieces are among many now headed for the safety of the Louvre. There is smoke damage, but French officials say the items can be repaired and restored. A French official says a difference of just 15 or 30 minutes could have resulted in a much different story. The cause of the fire appears to be accidental and there are no indications it was set on purpose.